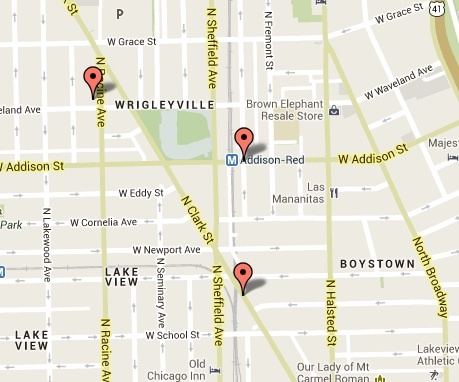 Three people were robbed within 51 minutes on the streets of Wrigleyville this morning. No arrests have been made. One block east of Wrigley Field (and one block west of the 19th district police station) a robbery victim flagged down officers to report being robbed by two black men in dark clothing, who fled north on Wilton Avenue from Addison Street. Officers toured the area with the victim, but they were unable to locate the perpetrators. Chicago Police Department case #HW319372. Editors' note: The police department officially categorized this crime as a pick pocketing. Police dispatchers reported "a lot of people calling about a lot of things" in the 3300 block of N. Clark Street between Buckingham Avenue and Roscoe Street. Among the many "things" happening: 50 people fighting in the street and a man getting punched in the face and robbed of his phone. Chicago Police Department case #HW319282. Two passersby reported that a man had been "beaten up and robbed of his property" on Waveland Avenue, one block west of Wrigley Field. The attackers fled in an unknown direction and have not been found. Meanwhile, the victim was transported to Illinois Masonic Medical Center for treatment of his injuries. Chicago Police Department case #HW319431. UPDATED 22 JUNE 2013: Added case number for 1:17AM robbery. UPDATED 24 JUNE 2013: Added case number and Editors' note for 1:06AM incident. Added case number for 1:57AM robbery. Corrected all times by one hour. Our original post's times were off by exactly one hour.